It’s been pretty stressful around here for the last couple of months so Randall and I booked a vacation, the kind where you lay around by a pool and a nice man brings you drinks and you can read your book all day long. The day before we were to depart our bathtub and sink began to drain very slowly. Randall went to the P-trap to attempt to snake it and the pipe promptly broke off in his hand. 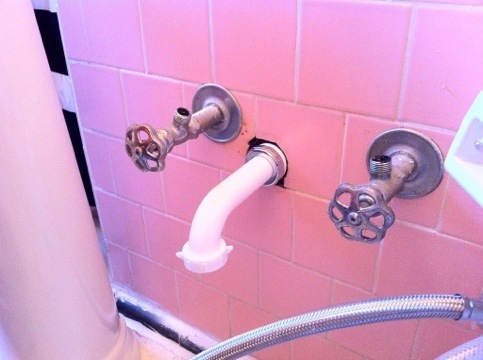 Oh 60 year-old plumbing! You little scamp. The old drain broke off where it threads into the sink and there was no way to replace it, so the whole sink had to go. Twist my arm! 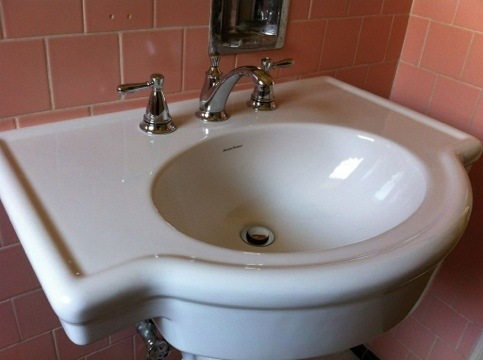 I hate that sink. But first we had to go on vacation. That was a week ago and now we’re back (vacation was AWESOME). We browsed for vanity-mounted sinks online at IKEA and the usual outlets, but the options were pretty dismal for something that was going to be temporary anyway (that wall will be knocked out in our eventual bathroom renovation). It’s a tiny space and the potential options weren’t great, so we opted for a retro pedestal sink that might actually work in our remodeled bathroom too. We found it at Lowes for surprisingly cheap. 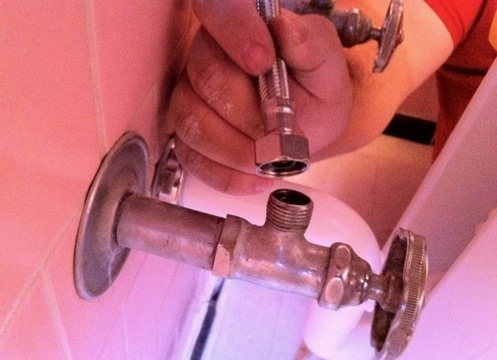 It seemed sensible to install the faucet before the sink was in place. We got a mid-range chrome faucet by Peerless. Look at this instruction sheet! Someone over there is getting cheeky. Randall figured out what assortment of pipes we’d need to bridge the space between the wall and the drain and started assembling. 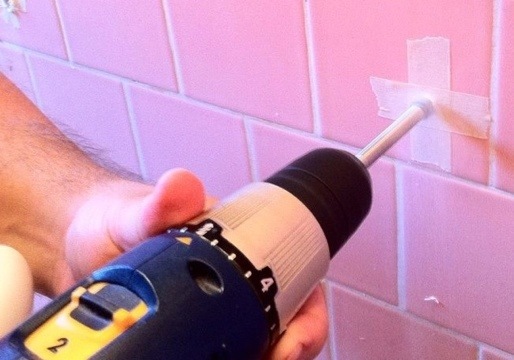 We got a carbide tip masonry drill bit to make the necessary anchor holes in the wall tile. We were told to drill through masking tape to keep the tile from cracking or chipping, and it worked. We did something very kludgey at this point. The installation hardware was two rods resembling a bolt on one end and a wood screw on the other. 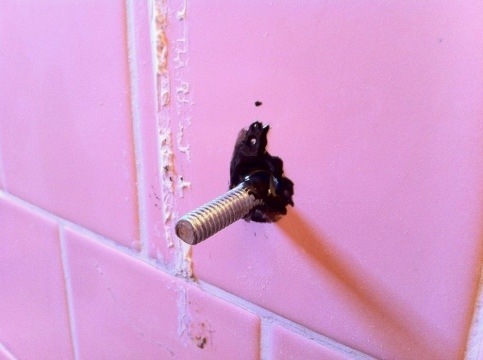 The screw end goes into the wall (presumably into a stud) and the bolt attaches under the sink. Well, we couldn’t reach any studs. Just tile and drywall. So instead of letting the screw spin freely in the drywall, we opted to attach it permanently with two-ton epoxy. I know this wasn’t the proper thing to do, but the bolts are for stability more than anything and eventually that wall is going away. The weight of the sink rests on the pedestal and it’s not going to move unless someone moves it intentionally. 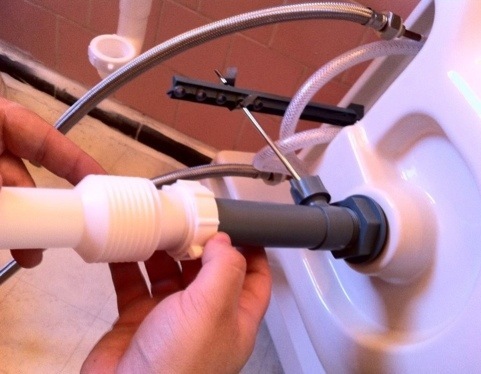 When we tried to attach the drain pipe to the wall we discovered that the wall pipe is kitchen standard size (1.5″), not bathroom standard size (1.25″). Back to the big hardware store for a length of pipe that steps-up to 1.5″. And finally when we went to connect the water supply the threads on the wall valves were ever-so slightly smaller than the threads on the supply lines. Back to the hardware store. This time we went to our locally owned store and I’m so glad we did. The guy there knew what we we’re talking about and had a solution before we even finished describing the problem (American Standard had their own standard size. At least in the 50s). All hooked up and no leaks. 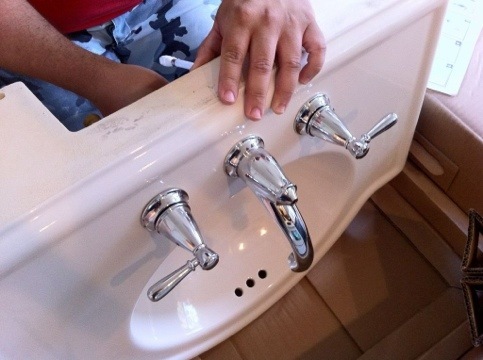 Behold… Sink! It’s so shiny and big and clean. Wow, you made it look so easy! I almost wish I had my own house and sink to replace. That was great pictorial.. Is the instruction sheet real? The instruction sheet is totally real! I applaud their sass. I’ll miss you, sweet house. Kim Whitley-Gaynor on I’ll miss you, sweet house.